A number of years ago, I stumbled across the best presentation I’ve ever seen. It was about the evolution and emerging ideas for the City of Philadelphia. Ignoring for the moment the merits of the plan and in hindsight, whether or not it was on the mark, the presentation is fascinating for how it conveyed a message. Lacking high-tech computer graphics, the most ambitious piece of technology in the whole thing was what appeared to be the steps used to enter a 1950s propeller plane. The presentation was by Edmund Bacon, the Director of the Philadelphia Planning Commission. (If you knew him, you were one degree of separation from Kevin Bacon.) Mr. Bacon and his colleagues successfully conveyed in simple graphics the origins of the form of the city. This film was followed two decades later by a series of short films on the evolution of London, Paris and Rome, which, in the same low-tech way, use historical drawings and walking to show how the cities we know today evolved from big idea thinking from a few individuals. These films are the building blocks for our upcoming Baconfest film series, where we will present these and other urban short studies covering a range of issues, from the historic Social Life of Small Places to a real eye-opener titled Where Children Play. Our goal is to encourage a dialogue among not only planning junkies, but anyone interested in their neighbourhood, community and city. Our playlist has something for everyone. I’m sure the film will generate discussion on many issues facing Calgary as it matures and grows into the vision of the Municipal Development Plan. Without a doubt, the first film, Form, Design & the City, will present ideas on how best to engage the public on complex ideas. And The Social Life of Small Places will change attitudes about what constitutes good public space. Cities across North America are dotted with barren, windswept outdoor plazas thought indispensable but largely unused. Give me a busy sidewalk with small shops any day. Welcome to our film festival. Please try to attend each film over the next few weeks, but if you cannot, read the film descriptions to find the ones of greatest interest. We look forward to your participation as we plan and implement our nextCITY. 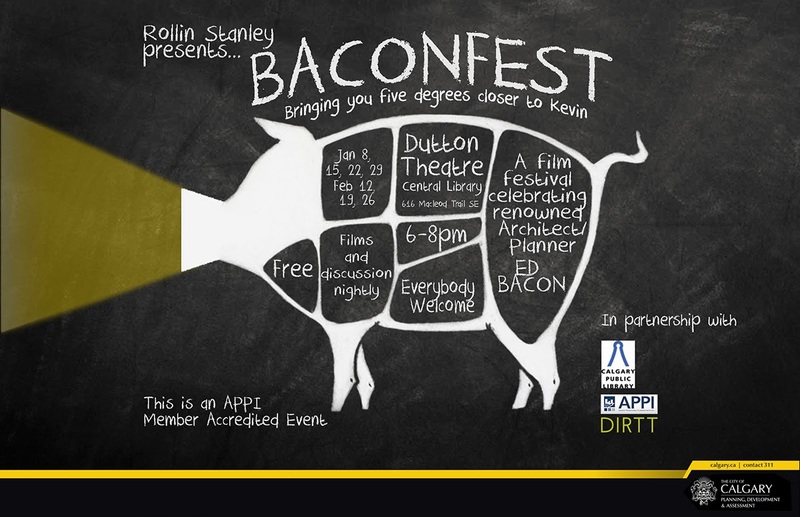 Baconfest runs from 6-8pm on January 8, 15, 22, 29 and February 12, 19, and 26 at the Dutton Theatre (second floor of the Calgary Central Library). For more information please visit: www.calgary.ca/baconfest.